Now, we aren’t using just your average carving pumpkin, but small, sugar pumpkins that are suited for baking and roasting. Their flesh is less fibrous, more delicate, and tastes better. You can find the sugar variety now in local markets & farmer’s markets. Sometimes you’ll see them labeled as ‘pumpkin pie pumpkins’ well, for that exact purpose! We’ll get to that recipe as we get closer to Turkey Day, but for now it’s time for dinner! Once roasted, our pumpkins and butternut squash will be blended into a base, and we’ll be adding a small amount of cream to smooth it out. We’re going to top the soup off with some delicious pancetta, and even a few of our toasted pumpkin seeds, just becasue we can! So, here we have one of my most favorite Fall meals, Roasted Pumpkin Butternut Soup, with Pancetta & Sage. Now, if you’re in a weeknight rush, I’d recommend saving this dish till the weekend, or for an evening where you have more free kitchen time. This recipe is quite hands-on at the beginning, since you essentially have to carve the baby pumpkins and get well, gory! Yep, hands-deep in gooey & sticky pumpkin guts (though that does seem appropriate with Halloween coming up), and you’ll have to split the stubborn squashes down the middle to get your halves. This takes a lil’ elbow grease and a rather huge knife, so hold off on that manicure till after you eat. Despite this seeming like a laborious prep, in the end you’ll be the proud chef of one palate-pleasing-pot-of-pumpkin goodness! And if that’s not enough, we save & toast the pumpkin seeds for added snacking bonus – a two for one! Fresh pumpkin & butternut squash are roasted with some other savory ingredients to make one fantastically flavorful Fall soup! We will add a little cream, sage, wine, & pancetta to make this one extra special. This one is smooth, creamy and delicious! fresh sage leaf and a few of the toasted pumpkin seeds for garnish! Halve pumpkins & butternut squash, scrape inside well to remove all seeds/guts & transfer seeds to a colander & set aside. Cut yam into 3 large chunks, can leave skin on because will remove later, once cooked. Peel carrot,cut into a few large chunks. Line 2 large rimmed baking sheets with parchment, then spray with oil to coat. On prepared baking sheets, arrange halved pumpkins & squash (flesh side up) with yam & carrots, and baste with EVOO & dashes of salt, pepper & sage. Over top of veggies lay several fresh sage leaves, evenly across squashes. To bottom of rimmed pans add water, enough to spread a layer across bottom of each (about 1.5 cups for each of my large pans). Roast pans uncovered for 45 minutes (mine had to go onto two different racks). While squash roasts, clean reserved seeds from pumpkins discarding guts, and rinse clean & allow to air dry, set aside. After initial 45 min of roasting in oven, check tenderness of squashes with fork, add ¼ cup more water to bottom of each pan as needed, cover with aluminum foil, continue to bake until all is tender and done, about another 45 mins, (add additional time for roasting until they are very tender). Once done, remove roasting pans from oven, allowing to cool enough to handle squash. 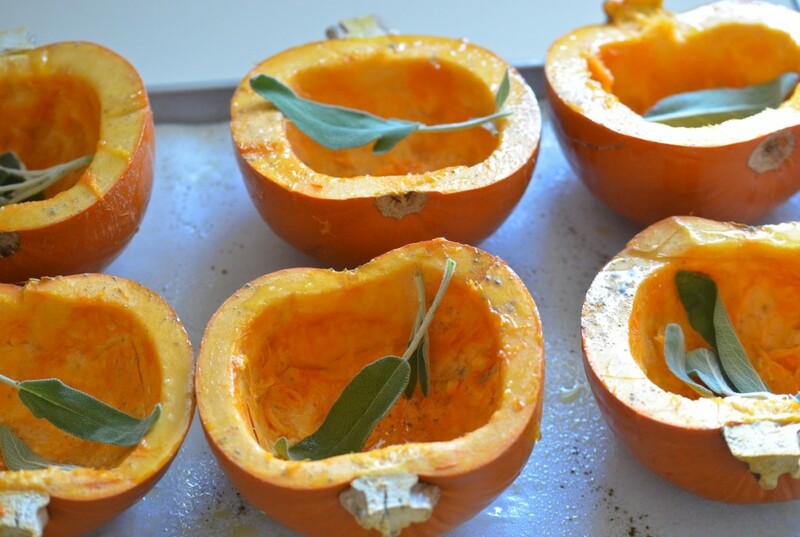 With large metal spoon, scrape out roasted/tender pumpkin & squash flesh from skins, place into separate bowl. Remove skin from yam chunks (should peel away easily now), and add to bowl with pumpkins/squash, also adding cooked carrot chunks (make sure carrots are tender). In large enameled dutch oven, add 1T from stick of butter & preheat pot (don't brown butter). Add 2 oz of package of diced pancetta (or chopped bacon) and brown. Once pancetta is crisp, remove from pot reserving drippings, and drain pancetta/bacon on paper towel, set aside for topping. To same pot with drippings, melt rest of the stick of butter & add 2 leaves of fresh sage (don't let butter burn). Add chopped onion, garlic & celery, sautéing in butter till tender, also add 1 tsp of salt, 1 tsp pepper, and ½ tsp dried ground sage and sauté. Add ½ cup of the wine & continue to sauté. Now add the roasted pumpkin/squash, yam & carrot chunks. Add ¾ the carton of chicken stock, stirring all well. Temporarily turn off burner & use hand-held immersion blender to puree vegetables thoroughly. Return burner to medium-low add remaining broth from carton & remaining 1 cup of wine. Now add rest of all seasonings: ginger, cayenne pepper, allspice, thyme & additional ½ tsp each salt & pepper. Simmer soup on medium-low for about 30 more min, stirring intermittently. 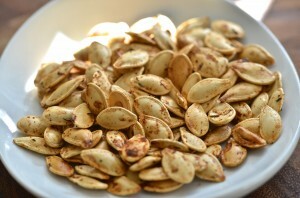 Make sure pumpkin seeds are virtually moisture-free & put in medium bowl. Add dash garlic powder & thyme dashes black pepper and salt, mix to coat. Add 1 tsp EVOO, mix seeds well. On lightly oiled, rimmed baking sheet, spread seed mix evenly & roast for ~10 min in oven, (after 10 min, stir seeds loose so they don't stick, and spread them around). Remove & let cool on pan. Stir soup on low & remove pot from heat/burner. Allow to cool slightly & add ¼ -1/2 cup of cream (or half-and-half) to your preference, stirring to combine. Once incorporated, return soup to burner, heat on low adding more salt/seasoning as desired (you can add additional chicken broth from optional can above, if you want yours thinner). Serve soup hot in bowls with topping of: dollop of sour cream, some crisp pancetta. For garnish add few of the toasted pumpkin seeds & sage leaf! The cook time for this soup is long because it also accounts for the roasting time in the oven, which is an 1-1:30 min about. Hands-on prep is only about 35 min & you can speed up the process by using your food processor to roughly chop the onion, garlic & celery! The soup itself only simmers for about 40 min on stove and you'll only need about 20 min for toasting the pumpkin seeds. (Can rinse and prep seeds while pans are roasting). This soup is very hands-on due to essentially having to carve pumpkins, clean seeds and scrape them once roasted. It is very helpful to use a grapefruit spoon to aid in removing seeds/cleaning pumpkin guts! Better to over roast the squashes, so make sure they are completely tender before removing from oven (may take another 30 min, depends on size of squashes). You can add more or less of the cream to your liking, or lighten-up using fat free half-and-half. The squash makes this one thick, but we use a handheld immersion blender to smooth out chunks, and we add chicken stock to reach desired thinness. If you do not have a handheld immersion blender, you can puree out the soup chunks in batches in your blender or food processor (prior to adding cream). Serve with crusty buttered bread! Leftovers freeze well also! I will say that I would personally like to thank the genious who engineered the ‘grapefruit spoon’ because that always makes deseeding/scooping out pumpkin guts WAY easier! So, if you have any kind of serrated-edge utensil, I recommend one! Also, prepping this one ahead makes it simpler. If you can clean the squashes the day before, and pre-chop the other ingreds ahead, it will save you time on meal night. This really is one of my favorite dishes and worth the fuss. It is warm, inviting and down right festive. The hearty fresh pumpkins & squash make for an inherently thick texture, once blended. You can skip adding the cream or half-and-half entirely, though I added a little over 1/4 cup of cream that I had on-hand, and it made this ever smoother. If you want to go meatless, skip prepping the pot with the pancetta/bacon and just use butter to sauté the onion/celery/garlic mix. I will say that the salty bacon/pancetta really imparts a wonderful flavor to this milder soup. We use a good amount of both fresh and ground sage here because it is the perfect flavor compliment to roasted squash… well, at least I think so! Though we’re adding some indulgent ingredients, this soup is fiber and antioxidant packed, and that never hurts. This is one of a few posts to come featuring Fall pumpkin & spice flavors, so stay tuned for more in the weeks ahead…! If you love pumpkin season as much as I do, I know you’ll love this soup… Happy Carving!